Above: This photo of The Sugar Tones is from a 1951 ad for Onyx 2009. Very little is known about this superb group consisting of three males and a dynamite female lead. Above: Onyx 2007. 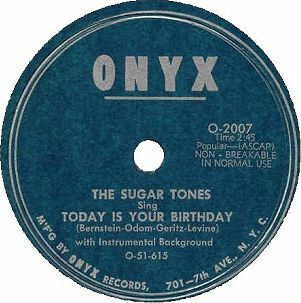 The Sugar Tones' version was originally released on Onyx in September of 1951, making it the original. It was later re-recorded for the OKeh label. 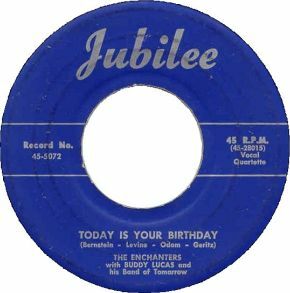 Between 1951 and 1954, they cut at least seven singles for the Onyx, OKeh, and Benida labels! Above Left: Jubilee 5072. The Enchanters were an all female quartet from Queens, New York featuring the lead voice of Della Simpson; with Pearl Bryce, second tenor; Frances Kelley, bass; and Rachel Gist, first tenor. Their version of this song was a cover, released in February of 1952. While they were an all female quartet, the bridge talking part is handled by a strong, but unknown, male voice. They had cut two sides for Jubilee when the group began to split up. Della found two replacements, and taking her name, they began recording as The DellTones for Rainbow. Above Right: Checker 791 (released in January 1954). 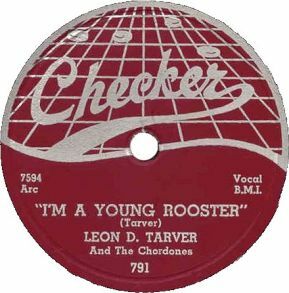 Leon D. Tarver, AKA Leaner "Lance" Tarver, was originally Leander Tarver, who had formerly sung with The Cardinals back in 1952! He made a couple of later sides such as this fine R&B jumper with a vocal group called the Chordones. He also sang and played piano as a solo, Leon Tarver, on Blue Lake. A) Click on an option below to listen to Streaming RealAudio. B) Click on an option below to listen to Downloading RealAudio. HAPPY BIRTHDAY TO ALL WHO HAD ONE, OR WILL HAVE ONE, IN 2001!